Welcome to Part II of The Minute Details series on the Rolex GMT-Master ref. 1675. In this series, we take an in-depth look at the tiny, seemingly-insignificant details, which can ultimately account for thousands of dollars in resale value for different vintage GMT 1675 watches. We previously covered the different crown guards, dials, and hands that can be found on this historic and highly coveted Rolex reference, so If you haven’t already, check out Part I here. A vintage GMT 1675 is a beautiful and highly valuable watch. 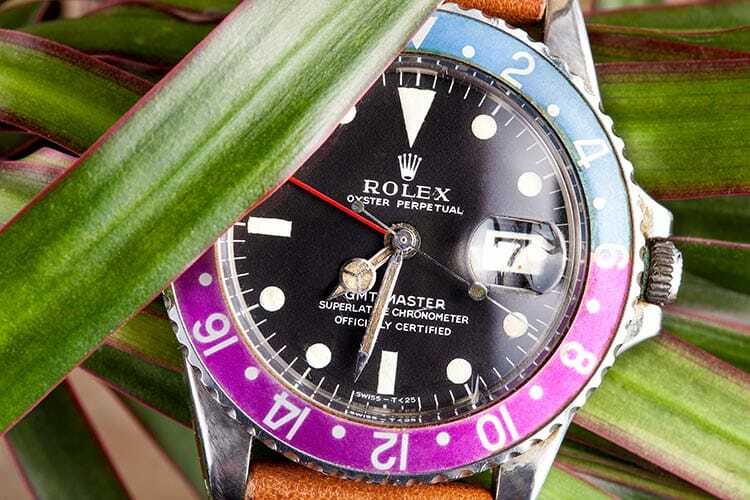 An instantly recognizable feature on many Rolex GMT-Master watches is the so-called “Pepsi” bezel. While its half-red, half-blue design is certainly reminiscent of the famous soda manufacturer’s logo, the unique choice in colors actually has its roots in the company colors of Pan Am Airlines. In fact, the very first Rolex GMT-Master (the ref. 6542) was created to meet a request from Pan Am Airlines for a watch that could simultaneously display two time zones. 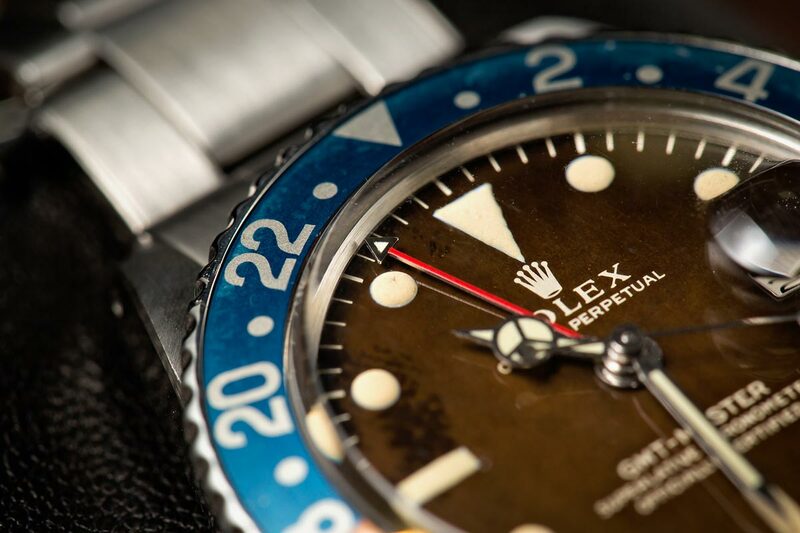 Ever since then, the famous red and blue “Pepsi” bezel has become one of the defining characteristics of Rolex’s GMT-Master line, and many examples of “Pepsi” bezel inserts can be found on ref. 1675 watches – like those that we are discussing today. Earlier versions of Pepsi inserts on GMT-Master ref. 1675 watches are often referred to as “Fat Font” bezels due to the visibly thicker numerals that make up their 24-hour markings. Over time, Rolex furnished later editions of GMT-Master ref. 1675 watches with bezels marked with thinner numerals. Needless to say, due to their lower production numbers and older age, Fat Font bezels are often more expensive to own than bezels with a thinner font. When Rolex introduced the GMT-Master ref. 1675 in 1959, the watch was only available with the Pepsi bezel. However, sometime during the early 1970s, Rolex added the option of an all-black bezel insert. Due to their iconic and highly distinct colors, Pepsi versions of the GMT-Master ref. 1675 are typically more popular than black bezel versions on the vintage market, and generally command a premium in price. There’s also the very elusive “Blueberry” bezel variant of the GMT-Master ref. 1675 with (as its name suggests) an all-blue bezel. Apparently, Rolex produced small batches of GMT-Master ref. 1675 watches with blue bezel inserts that were destined for the French Air-Force, the UAE Air-Force, or top retailers such as Cartier and Tiffany. Very rare and highly counterfeited, original Blueberry watches are some of the most rare and expensive GMT-Master ref. 1675 models to own. 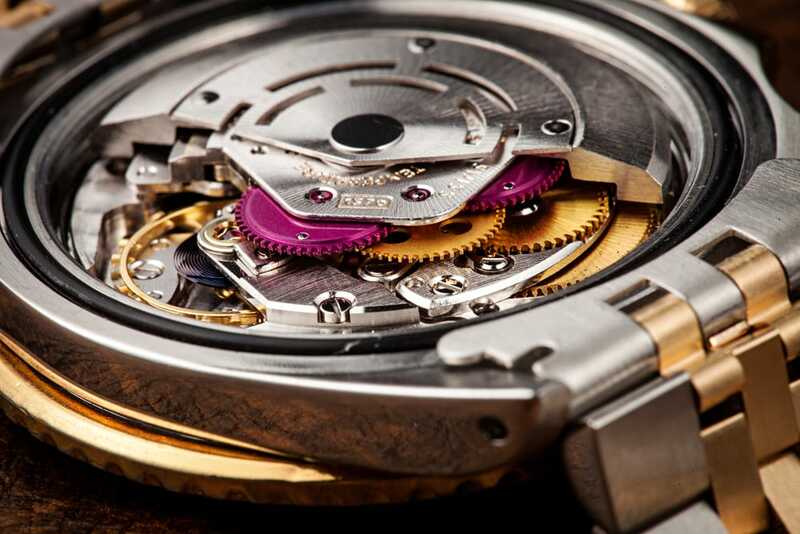 An inside look at the movement of the vintage GMT 1675. During its two-decade-long production run, Rolex equipped the GMT-Master ref. 1675 with two different automatic mechanical movements. GMT-Master ref. 1675 watches produced from 1959 until about 1964 are powered by Rolex’s Caliber 1565, which has a frequency of 18,000 beats per hour and offers users a 44-hour power reserve. Conversely, those produced after 1964 received Rolex’s Caliber 1575 movement, which features a frequency of 19,800 beats per hour and benefits from an increased power reserve of 48 hours. Furthermore, from 1971 onwards, Rolex equipped the Caliber 1575 with the “hacking” function, where the seconds hand comes to a complete stop when the winding crown is pulled out to the time-setting position. Both movements are COSC-certified chronometers, as illustrated by the “Superlative Chronometer Officially Certified” text on the dials of all GMT-Master ref. 1675 watches. Yet again, while the later versions included a higher frequency and a slightly increased power reserve, age trumps practicality in regards to value on the vintage market. Older versions equipped with the Cal. 1565 will typically sell for more than later models that are powered by Cal. 1575 movements. This vintage GMT 1675 with a fuchsia bezel still keeps time to a very accurate measure. So, How Valuable is a vintage GMT 1675? Prices of GMT-Master ref. 1675 watches range significantly, from as high as $50,000 to as low as $10,000. As expected, earlier models that still have their original bezels, original dials, original hands, and original bracelets will often command the highest prices. Newer models will generally cost less, and the value of any vintage GMT-Master ref. 1675 really starts to take a hit if it has a number of replacement parts – even if the overall functionality of the watch is improved because of them. While not all Rolex GMT-Master ref. 1675 watches are considered equal, they are all truly beautiful and storied timepieces to own. Additionally, despite not being the very first GMT-Master reference that Rolex ever released, many collectors consider the ref. 1675 to be the quintessential vintage example of Rolex’s iconic, multi-time-zone pilot’s watch. What do you think of the Rolex GMT-Master ref. 1675 watch? Do you own one or would you like to own one? We’d love to hear from you, so share your thoughts and pictures with us in the comments section below!